Tourism officials on Thursday unveiled a long-range plan that calls for linking the Augusta Common to a riverfront center , increasing public artwork in the city center and allowing visitors to tour downtown in rented golf cars. Those proposals, and a half-dozen others, were pitched to community leaders as part of a strategy to make the city more attractive to visitors during the Augusta Convention & Visitors Bureau’s annual “State of Tourism” event. “This is our roadmap – our blueprint – for the next 10 years or more,” CVB President Barry White said in an interview before the plan was presented during a luncheon at the Legends Club. Called Augusta’s “Destination Blueprint,” the plan had only been seen by small groups of city officials and business leaders. White said the blueprint’s recommendations were heavily influenced by ideas and concepts already identified in several downtown studies , including 2009’s Westobou Vision Urban Area Master Plan and the more recent Augusta Downtown Concept Plan by Cooper Carry, the Atlanta-based firm designing the city’s transportation tax-funded downtown streetscape projects. 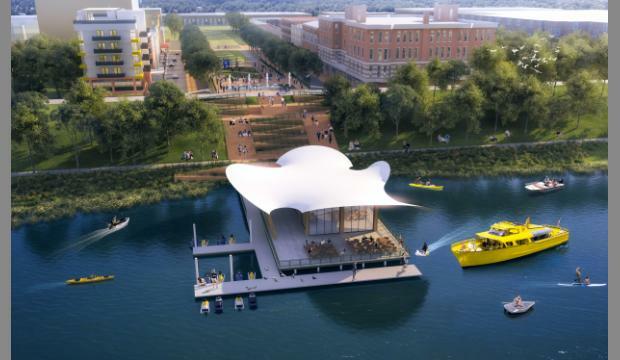 • Augusta Common extension: The plan calls for the downtown park to be expanded north across Reynolds Street to the levee, where a gradual incline would form a plaza at the top that connects to a floating “riverfront destination center” where visitors could rent canoes or bikes, take boat rides or simply enjoy drinks and snacks in the heart of downtown. Most of the property the expanded Common would occupy is vacant and owned by Morris Communications Co., parent company of The Augusta Chronicle. The CVB’s artist renderings depict a tree-lined promenade extending across the property lined with various commercial and residential buildings. • Defined downtown districts: The plan would delineate sectors based on how they have naturally developed over the years. The “Hospitality District,” for example, would encircle the Augusta Marriott at the Convention Center and its adjoining properties, while the “Arts & Culture District” would encompass sections of lower Broad Street where the Augusta Museum of History and historic theaters such as the Miller, Imperial and Modjeska are clustered. Several blocks of upper Broad Street, which has most of downtown’s bars, restaurants and art galleries, would be the “Dining & Entertainment District” while the “Medical District” would denote the health care cluster formed by University Hospital, the Charlie Norwood VA Medical Center and the Augusta University Medical Center at the corner of Walton Way and 15th Street. • Increased public art: Public sculptures and statues in Augusta is deficient compared to peer cities, White said. The plan says downtown Augusta has 13 public art examples in a one-mile radius compared to Greenville, S.C.’s 53. Asheville, N.C., White said, has 30 examples of public art within a half-mile radius of its downtown. “If you think about great destinations and what they’re delivering, we’re a little behind,” he said. The plan suggests creating a pedestrian connection between the Springfield Village Park and the Augusta University Riverfront Campus to promote the properties’ potential for public art gardens. The golf cars for self-guided tours would be housed near the CVB’s downtown visitor center, which is expected to open at 1010 Broad St. in 12-14 months. Other golf vehicles could be operated as a shuttle service by a third party vendor, such as Nashville, Tenn.-based Joyride, which operates in that city as well as in Knoxville, Tenn., Tuscaloosa, Ala., and Panama City Beach, Fla.
“The target is the ‘last mile – distances that are too far to walk, but not far enough for a taxi or Uber,” White said. White said the company plans to launch service in Birmingham, Ala., and Athens, Ga., this year. • Family entertainment development: White pointed to the Columbus, Ga.’s Chattahoochee River Park, which offers urban whitewater rafting and ziplines, as an example of an “adventure park” that could be developed along Augusta Riverwalk. • Urban trail completion: The plan says the city should concentrate on finishing the final trail sections to connect to the network that extends up the Augusta Canal to Columbia County and across the Savannah River to North Augusta. • Creation of an international music festival: Though previous uses of James Brown’s name for festivals have been met with mixed success, the plan recommends creating an international soul music festival whose business plan forecasts profitability within five years. • Addition of “rectangular” sports fields: Compared to peer cities, metro Augusta is deficient in sports fields that can be used for soccer, lacrosse and Quidditch, a new co-ed contact sport adopted from the Harry Potter series of fantasy books. Aside from analyzing previous downtown studies, White said the CVB received input from groups such as the Georgia Forward-Young Gamechangers, the city’s recreation and parks department, the Greater Augusta Arts Council and from individual responses to 25,000 surveys to residents, visitors and travel writers.